This kit is designed for 1-5 single faced intact tritium exit signs or two (2) double faced signs + one (1) single faced sign. Radioactive exit signs contain a gas called tritium (H-3) that provides illumination inside the sign. The tritium is sealed in glass ampules inside the sign. The signs are very durable and are manufactured to contain the tritium which has a 12.3 year half-life. With time, a sign will not be as bright and requires replacement. Exit sign end-of-life management is regulated by the Nuclear Regulatory Commission (NRC) and radioactive exit signs are required to be properly managed. A notice to the NRC must be made by the owner of the exit signs after shipment. All exit signs are recycled to recover the tritium gas for the manufacture of new exit signs. A Certificate of Transfer and Recycling (CTR) will be provided after receipt and processing. This unique mail-back kit is easy to use and comes with detailed packaging and return instructions. Each kit will also have a DOT Function Specific Hazmat Training and Acknowledgement for Return of Self-Luminous Exit Signs form that serves as the training required to ship this specific kit. 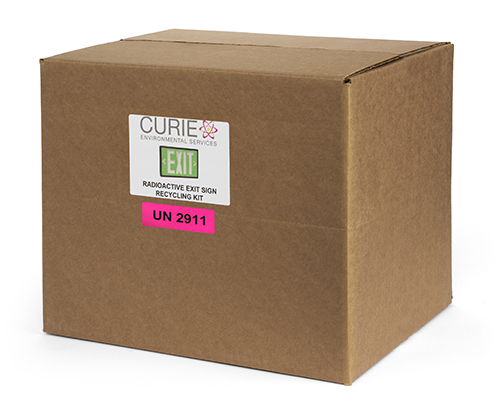 The radioactive exit sign recycling kit includes an outer 15” x 15” x 12” adjustable fiber box, inner liner, cushioning, packaging instructions, DOT markings, DOT function specific training and acknowledgement, prepaid UPS ground shipping both ways, inventory form, NRC Fact Sheet - Tritium Exit Signs, and NRC transfer notification instructions. The kit is designed to qualify as a DOT strong tight package for shipping as: UN2911, Radioactive materials - excepted package, articles, 7. Pricing is for any location in the lower 48 United States and for individual exit signs with activity not greater than 22 Ci. This recycling service is also limited to exit signs that do not have damage to the inner tritium containing glass ampules. If individual exit signs exceed 22 Ci or are damaged, and may be leaking, contact customer service. PLEASE NOTE: An inventory must be sent for approval prior to purchasing this kit. Please click HERE for an information package containing all the instructions and forms you will need to get approval. Once your inventory is approved, LifeCycle will contact you to complete your order, and your kit will ship within 2 business days via UPS Ground service. You will be provided with a return material authorization (RMA) number authorizing your shipment to Curie Environmental Services.